This Guy Turns Old Tires Into Fancy Animal Beds. Just Look at How Cute They Are! Amarildo Silva says that he never expected his side job to turn into his calling, but this is exactly what happened when one of his projects started to gain attention on the media. 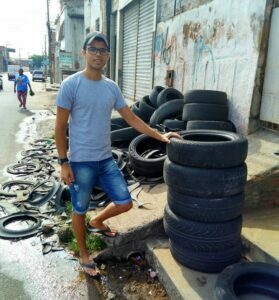 The young man from Brazil first came up with the idea of reusing the old tires when he was working as a cashier at the local store. He told the press that the money he earned did not satisfy his personal ambitions, that’s why he decided to run a side business as an additional source of income. Now, Silva is turning his hobby into his specialty. 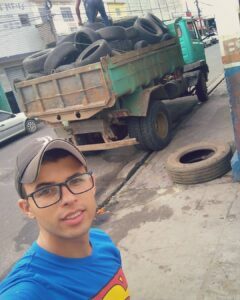 Whenever he has time on his hands, he goes roaming the streets and searching for the discarded tires that are scattered all over. Once he comes home, he gets down to work and transforms them into animal beds. 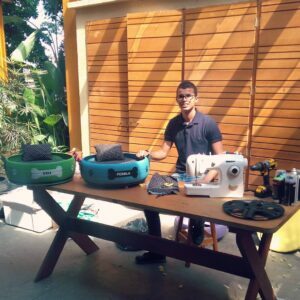 His business has helped him earn a lot lately, and the man adds that he started receiving orders all the way from Europe, Asia, and North America. 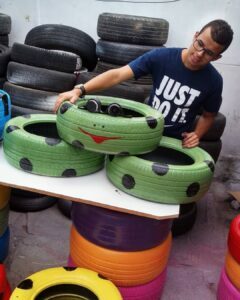 In addition to repurposing the tires, Silva is making the most out of the flowerpots and containers. He is also doing public talks in schools across the country and telling kids about his business as a reliable source of income and a way to help others! This man found a way to change the world for the better and help the environment. He is looking for the tires whenever he can, and that is amazing. 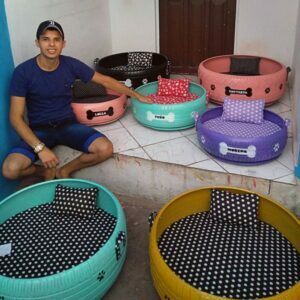 The collection that Silva possesses at the moment allows him to transform the tires into great beds for animals across the country. Although repurposing old objects is not a brand new idea, one stops to think why no one has ever done that before! The beds have various designs, and the man’s creative attitude is inspiring. There is a mattress that needs to be added to each of the beds for additional comfort. 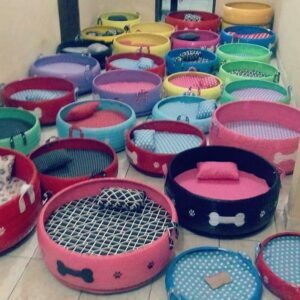 The sleeping spots for cats and dogs are so attractive that you will want to buy them at once. The colors are also charming. 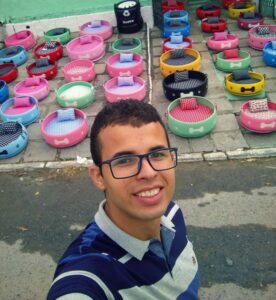 Here is Silva posing with the collection, and we hope that he is going to sell more of the items in the future. 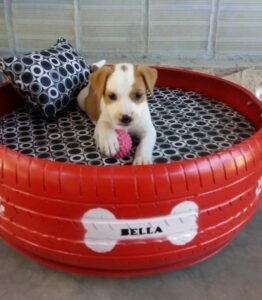 Furbabies are enjoying the gifts from their owners, and Bella is not an exception. 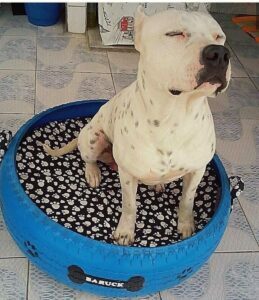 Baruck believes that his new bed is one of a kind, and his face says it all. Bidu has invited a friend to test out a new bed. 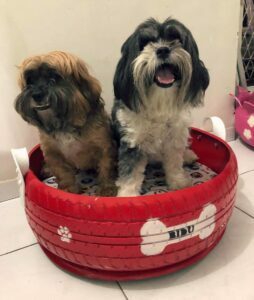 The duo will make you smile as soon as you see them posing happily for the owner!